For tips about each option point your mouse over . Optionally when creating a campaign, you can define the <From-name>, <From-email> and <Reply-to-email> values just for this campaign. Some SMTP servers may not accept these custom values and instead use the actual <From-name> and <From-email> used for SMTP authentication. These settings can also be defined per mailing list (when using the custom list settings) and if they are then the campaign should involve only this list. The custom sender settings (at campaign level) override the custom list settings (if applicable) which override the global sender settings. 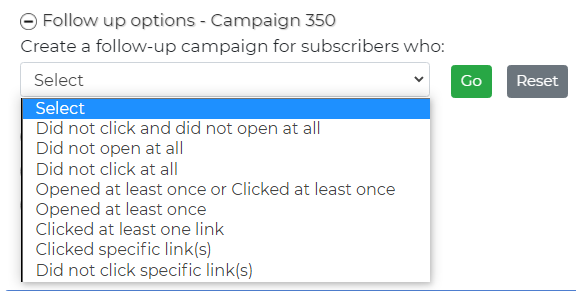 This option is available when sending a campaign to “all lists” or “selected lists”. This option is available when sending a campaign to “all lists” or “selected lists”. A subscriber has a confirmed/verified status at list level. If the subscriber is confirmed for at least one list (but perhaps not in others) then he will receive the email. You can create a campaign even if the count returns 0. This is because you may want to schedule this campaign (or execute it at a later time). When you send both an html and a text newsletter at the same time then you are sending a multipart newsletter. If a recipient’s email client cannot display html it will display the text version. Both parts will be personalized and tracking links will apply. There is absolutely no compromise with this method. But there is a downside: too large size of an email since in essence you are sending a double-sized email per subscriber. And in fact you must prepare two newsletters for each campaign. A trick that may save you time is to prepare the html one and then automatically create a text version of it. If you have subscribers that are likely to use old email clients that cannot read html, sending multipart emails ensures that they will eventually be able to read your newsletter. Tests have indicated that a multipart newsletter is treated better by spam filtering engines. The idea is to make a multipart campaign where in the text newsletter you have a smart link to redirect the subscriber to read the html newsletter in the browser. Practically it works exactly like the “Smart link” that you have in html newsletters “Read this newsletter in your browser”. With version 6.5 every html email becomes a multipart. A text part is automatically added with a link to read the html version in your browser. You can change the introductory comments in your languages file. You can send a web page that is located on a web server by giving the URL of this page. You can do this when creating a new campaign. You must also give a subject for this newsletter. The result is like sending an html newsletter. If you have used personalization tags (like [sub_name] etc.) then the page will be personalized for each subscriber. In addition, if your page links to css files and images these should be referenced in absolute terms (full path). With this method views and clicks tracking statistics work in exactly the same way when you send an html newsletter. When using Google Analytics what you actually track is the website(s) traffic that results from the links in your newsletters. You can track the behavior of the subscribers who followed these links inside your Google Analytics account by going to Traffic sources > Campaigns. In short, your newsletter becomes another source of traffic and this can be tracked. Which means that you must already be using Google analytics at the sites you want to track. The URL building is done automatically by nuevoMailer. It parses the links in your newsletter and adds the campaign parameters as required by Google. This Google Analytics link parsing of nuevoMailer works with or without the internal clicks tracking mechanism. In fact it works as a good extension to the internal clicks tracking mechanism. You can either send the campaign manually or with cron (scheduling). Manual execution requires that you keep your browser open. It is handy for small campaigns and testing. With cron everything is done in the background at the server. Learn how to set-up a cron job here. Whether you send manually or with cron a log file is created. To see your log file go Menu > Campaigns > View log file. It shows if you cron job is properly set. It shows potential campaign errors (smtp errors etc). 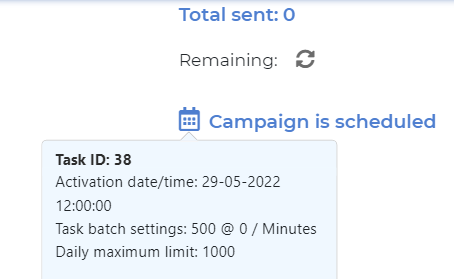 It provides details about the timing of your campaigns: which campaigns are sent, the time it takes for a batch to complete etc. It gives insights whether your batch (and related) settings are optimal. To make changes to a running campaign (even if the mailing has started). Click the "Edit" icon. Your changes will take effect with the next batch. If for any reason you want to stop your mailing then click the "Pause" icon . The pause is effective when the currently running batch is complete. Then at anytime later you can click the "Resume" icon . The sending will continue from where it stopped (either by cron or manually). There is no need to pause the campaign just for editing it but it is a good practice. If you make changes to your newsletter while the campaign is running then these changes will take effect with the next batch. 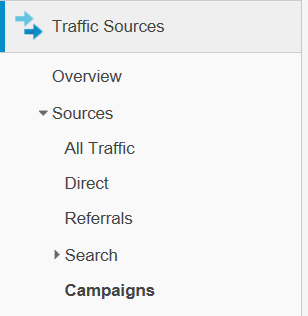 To start a campaign manually go Menu > Campaigns > View & start campaigns. Click to see the remaining emails to be sent. Click “Start mailing” to start the sending process. A new pop-up window opens and the button is disabled. Do not close your browser. If you use batches then after a batch is sent you will see the following screen. This window refreshes automatically after the batch pause and starts sending the next batch. if you want to stop the mailing you can close the pop-up window. However, some more emails will be sent (since the process is now running at the server). When you schedule a campaign to run in the background with cron you also create a scheduler task. Point your mouse over and you will see a pop-up with information about this task. You may edit, pause/resume a scheduled campaign. A recurring campaign is one that runs periodically. E.g. 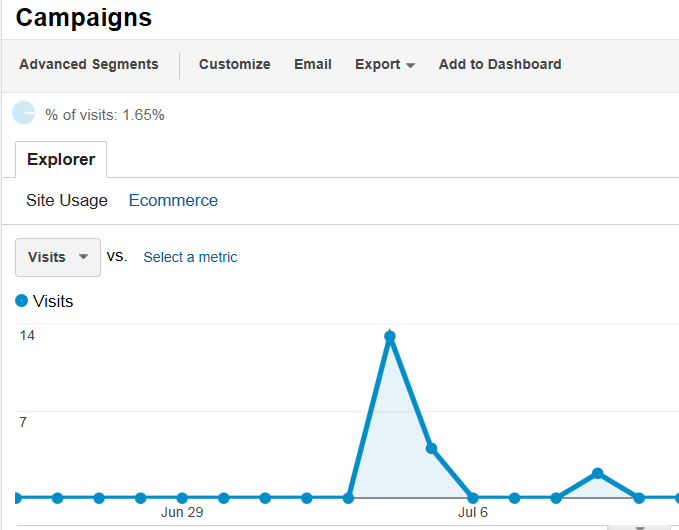 daily, weekly, every few days, once a month etc..
Auto-responder campaigns. When you want to send a newsletter to new subscribers after X minutes (hours or days). Anniversary campaigns like birthdays. nuevoMailer greatly facilitates the collection of dates from your subscribers by having date-type fields. Your weekly, monthly news updates. if you define an End date then the campaign recreation process stops at this day. After a recurring campaign runs, a new one is created and the task points to this new campaign. Sometimes your subscribers forget or neglect to confirm their subscription. The idea is to send confirmation reminder campaigns that start a few days after they subscribed and stop after a point in time. - start from the 10th and stop after 30 days from subscription. The concept described above can be applied in several cases. Instead of a confirmation campaign it can be a simple auto-responder that is sent to your subscribers every week, starts after the 10th, and stops after X days. A campaign series is a type of a recurring campaign in which you can load a number of newsletters that will rotate with every next campaign. Which day of the week? As you can see above we set the activation date on January 7th, 2015 which is a Wednesday. Since the campaign repeats weekly it will be sent every Wednesday. To set the day of the month set the activation date to the day you want. In the special case where you want this campaign to be sent on the last day of the month choose 31 or 30. nuevoMailer will always pick the last day of the month whether that is 30 or 31 or 28 or 29. Keep the same newsletter and edit its content just before the next campaign starts. Edit the campaign and choose a different newsletter. Changing newsletter by editing the campaign is probably better for archiving reasons, than keeping the same newsletter and replacing its content. This approach is typical for those publishing newsletters on standard cycles (weekly, bimonthly, monthly etc). Many authors find it convenient to send a web page as a newsletter. What they do is to set-up the campaign as above, always use the same URL and just before the campaign starts they update their web page. You have many options. Creating a campaign series is a good way for long term list nurturing. It is usually the first auto-responder emails and triggers that you will use to engage your subscribers. Then you can just put them in a long term campaign using a newsletter series. So let's assume that for their first 10 days you have used auto-responders. Then there is a special filter that you can add to a campaign series so that it will pick subscribers 10 days after subscription. You have two options for which subscription date to use. 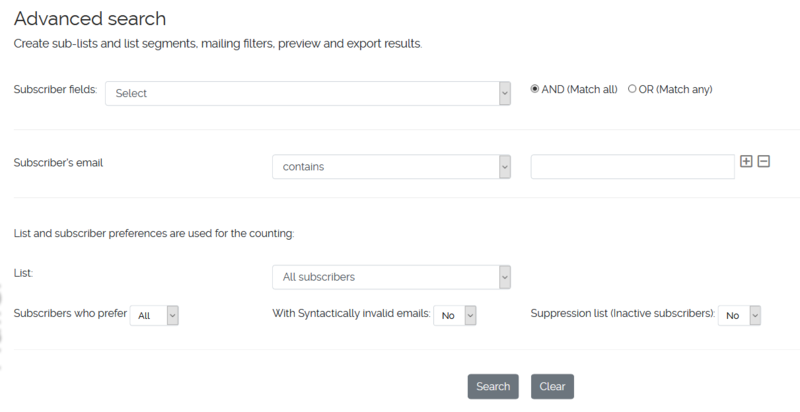 dateSubscribed refers to General subscription date. The first time a subscriber was added to nuevoMailer. iDate refers to List sign-up date. The first time a subscriber was added to this list. When working with one list it is better to use the iDate in your filters. Occasionally these two are the same. An auto-responder is a series of timely campaigns that are sent automatically to subscribers in the order and frequency you choose. 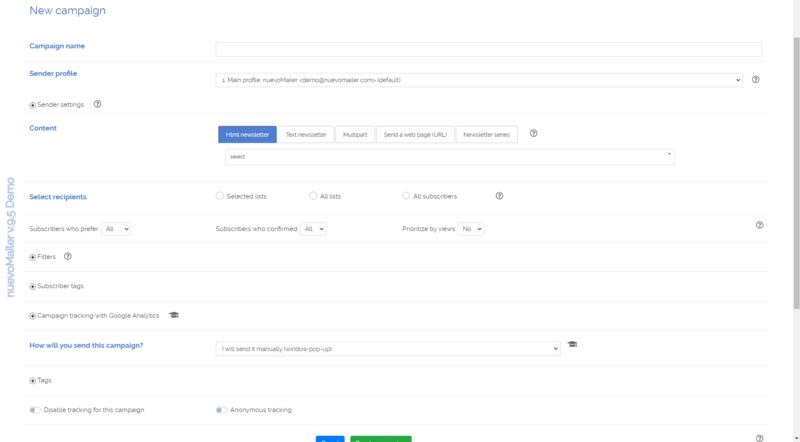 nuevoMailer supports auto-responders based on subscription time (list sign-up) or a subscriber date type field. nuevoMailer auto-responders are fully featured independent recurring campaigns with statistics that recycle forever. As you can see we have one more option here: Full date comparison. When checked this auto-responder will fire only once, exactly 7 days after the exact wedding day. If not checked then it will fire every year, 7 days after the wedding date. In this case the filtering is done by checking only the month and day (and not year). For birthday newsletters you do not want a "Full date comparison". You can set-up different series of auto-responders that correspond to different lists. These lists may come from specific opt-in forms. If each form uses one list only you can also activate the custom list settings. If I already have subscribers on my list, what happens for them when I create a new auto-responder for this list? It depends on when the subscribers were added to your list (the list sing-up date). So if the date condition of the auto-responder is met they will receive the auto-responder. When you manually add subscribers the subscription IP takes the value "admin". When they use a sign-up form their real IP is recorded. With nuevoMailer you can capture (or import) your subscribers birthdays (or other anniversaries). 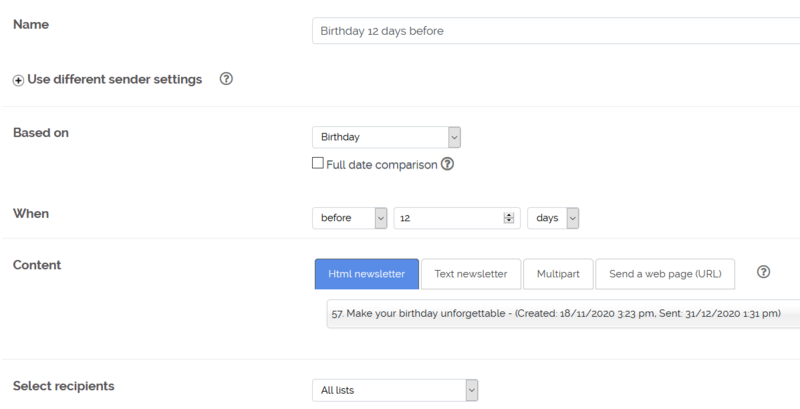 You create a birthday filter, a "Happy birthday" newsletter and a campaign that uses them. The birthday campaign must be recurrent and run every day. It starts by setting-up a custom field to use for storing birthdays. Then in the same page define this field. Refresh your welcome page to verify that your birthday field is active. Follow the link and explore this page. Yes!. What's described here can also be applied for other anniversaries. E.g. wedding dates. Set-up another custom field to store these dates. These reminders are for you, the administrator. You can set-up a cron job to run daily and notify you about this day's or next days birthdays. To set the number of days in advance open the file inc/settings.php and change this variable. You can create follow-up campaigns based on the clicks or views from a previous campaign. You are creating a new campaign identical to the previous one (uses the same list(s) and newsletter(s)). A filter is created in the background and it is added to this new campaign. It is the filter that will make the difference in the selection of subscribers in the new campaign. If the old campaign was already already using a filter this won't be included in the new one. Create only a filter: checking this box will crate only a filter and not a new campaign. You may want to use this filter in another campaign with different parameters. If the campaign was sent to all subscribers then you can only create a filter (without a campaign). This is because filters can be used in campaigns to all lists or to selected lists. In this case you will find the checkbox already checked and disabled. For time-sensitive follow-up campaigns see auto-responders. Email Triggers is another way for following up on an individual basis. See below. On list sign-up => see auto-responders here. For a very good overview of the triggers functionality in nuevoMailer and implementation ideas see here. The triggers set on the parent will also apply to the children. When you add new trigger on a child campaign it also updates the parent (and the whole branch). 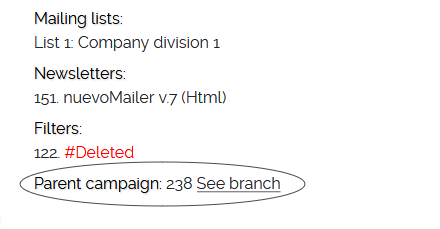 If you delete the parent campaign the old trigger will still apply to previous campaigns that were sent (of the same branch). But if you create new trigger for a child (after the parent has been deleted) then this will apply to this campaign and its children that will follow it. Assume you create a trigger to send a single email on an action such as a view or a click. A subscriber may do a view or a click several times as soon as he receives the newsletter or even days or months later. nuevoMailer can prevent the sending of the triggered email multiple times (with each view/click) by marking the triggered email as processed. But sometimes it may be useful to fire this trigger again after some time and if the view/click action happens again. $triggerExpiry = 10;    //Number of days-after to remove a processed trigger from the queue. So after 10 days the triggered email will be sent again (assuming of course that the action that triggered it is repeated). Building on the email triggers feature you can also send transactional emails from your own CRM/CMS or website using the api. You only need to "post" a subscriber email and a newsletter ID. If the subscriber exists in your database then the newsletter will be personalized. If he doesn't exist then you can optionally subscribe him at the same time, in one step. Filters are extra criteria that you can apply to a campaign and will result in excluding or including subscribers on the basis of demographic parameters, tracking behavior, subscription dates and more. You can view your filters under Menu > Filters > View filters. Every filter contains a short description and SQL code. You can edit both if needed. Simply click on the description or the code. 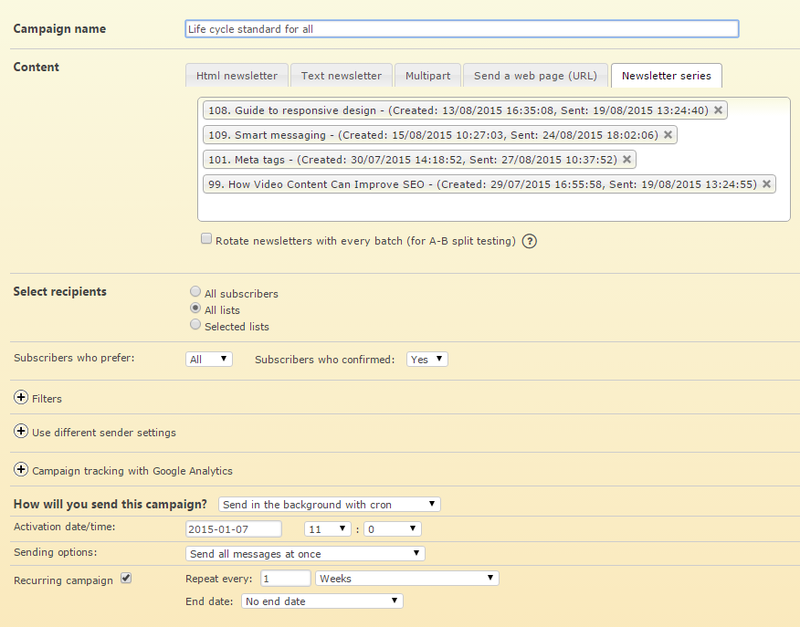 Filters can be used when you send a campaign to All lists or to Selected lists. Such filters are created automatically when you create follow-up campaigns. preview and export the results to spreadsheets like Excel, CALC. 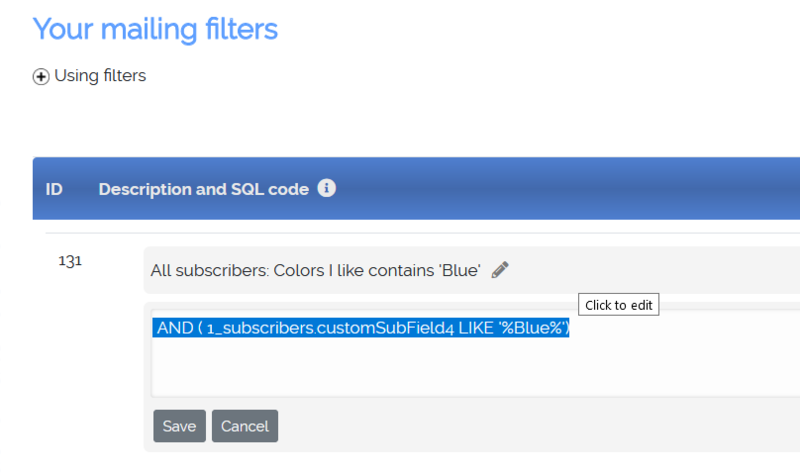 You simply create an empty filter and then you can add your own sql code or copy code from another filter. If you are familiar with sql syntax you can change the sql code and refine an existing filter. You can also merge filters or create your own. You can test a filter when creating a new campaign. You select the subscribers or lists and the filter and you click “Count”. Count with and without selecting a filter so you can see the difference. Create a sub-list or a mailing filter? If you plan to make a new list that you will use in the future then it is better to create a sub-list with the search results. If you only want to do a few mailings to this subscriber group then it is perhaps better to create a mailing filter. The answer really lies in your subscriber management approach. You create the campaign using a Newsletter series. 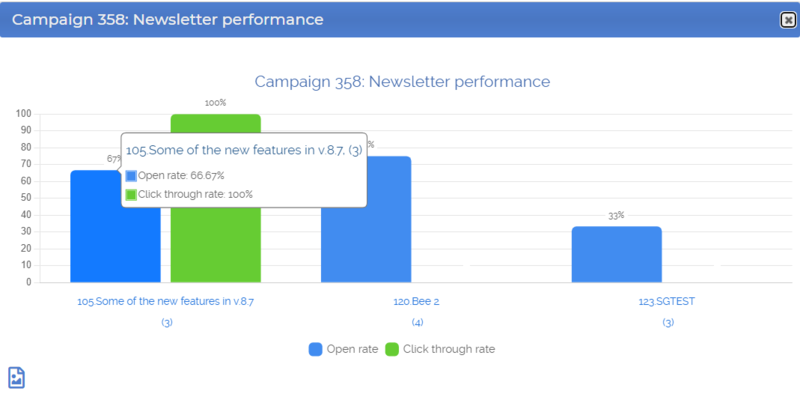 Make sure you check Rotate newsletters with every batch (for A-B split testing). Make sure that you use batch settings for this campaign. Start the execution manually or schedule it. Let your campaign run for some time until several batches are sent. You can then edit your campaign, choose the best performing newsletter and resume the sending. The hits in the report above are absolute numbers. They are not relative to how many times a newsletter was sent. Therefore it is important to let the campaign run some rounds (batches) in order to have a large enough sample. IF YOU ARE USING NUEVOMAILER V.4 OR EARLIER HERE IS ANOTHER METHOD. You can split your list between odd and even records. You will create two campaigns targeting the same lists using different newsletters and different filters. If you see that one particular newsletter design or subject line is more attractive you can use it in your future campaigns. Note that you can use other filters as well to split subscribers. For example you can use subscriber country or zip code or city. You can merge (add filters together) by putting together the sql code of each filter and using an AND or an OR operator. Here is an example. One filter that picks subscribers with Hotmail and Yahoo email accounts. If you are familiar with SQL programming you can do many tricks, use AND, OR, EXISTS statements and construct complex filters. Usually there is overlap between lists. Meaning that subscribers belong to more than one list. Q: I want to make a campaign to lists A, B, C but I do not want to include anyone on those lists who is also in list D.
Which means that those who are subscribed in list with id D will not be included in the campaign (no matter if they belong to A or B or C). This is an add-on plugin that is not included in the core of nuevoMailer. Learn more about it. Multi-threaded campaigns are sent in batches. This number refers to each thread. you define here how many processes (threads) each cron hit initiates. This distance refers to thread start times. So assuming you give a 5 seconds distance, every 5 seconds a new thread will start. - number of emails in a batch is 5000. - number of threads is 20. - distance between threads is 5 seconds. A cron hit will initiate 20 threads that start every 5 seconds and each thread will send 5k emails. So each cron hit will process 100k emails.